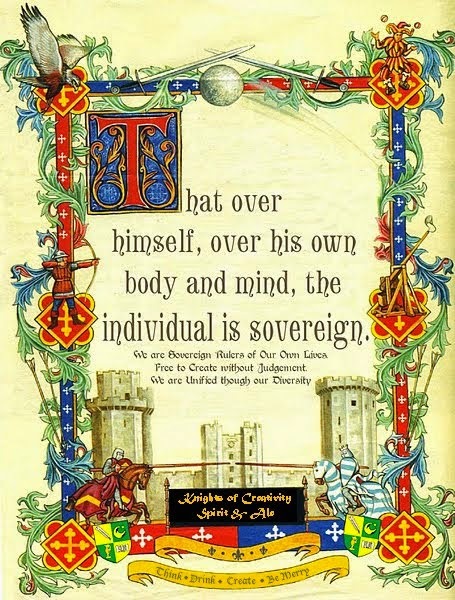 Knights of Creativity Spirit & Ale: Strange Brew...Stuff! 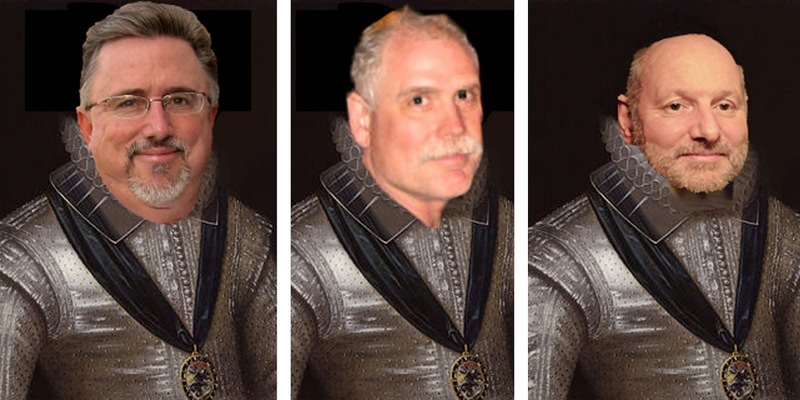 While Sir Hook rests up from his arduous trip and writing of two excellent posts, I thought I would offer you something completely different. Beer + Milk = Bilk! Do you need some extra vitamins and nutrients in your daily diet? Well, perhaps Bilk will help you. Combining the power of beer and milk, this product sounds like something you would drink before bedtime to help you sleep better. The product was devised by Japanese brewers as a practical solution to a milk surplus problem. 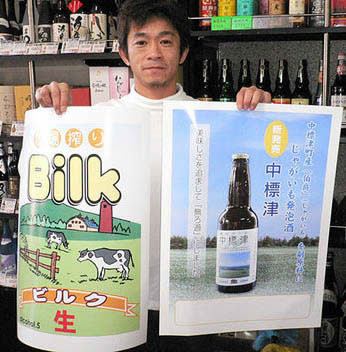 Bilk contains 30% milk and is said to look and taste much like regular beer, although it has a milky aroma. If you have ever tasted Marmite (a food spread made from yeast extract), you either love it or hate it – there is generally no middle ground. 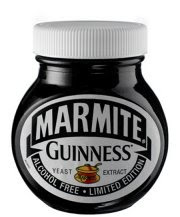 So, a Guinness flavored Marmite is targeting a very niche market. For this special edition, Marmite used a recipe with 30% Guinness yeast to provide an alcohol-free Guinness flavor. Guinness is famous for adding robust flavor to stews, but as something to spread on your toast – an intriguing thought! Is your dog jealous of your beer habit? When you crack open a dusty bottle of Leffe, does he look longingly, sniffing the air expectantly? 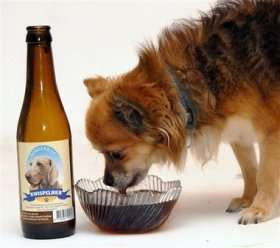 If so, a Dutch brewery has developed beer for dogs, so Rover can join you in enjoying a regular tipple. Named ”Kwispelbier” (Kwispel being the Dutch word for tail wagging), it’s a combination of beef extract and malt and is tagged as “a beer for your best friend”. 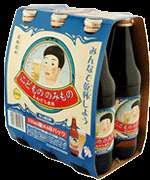 Incidentally, the beer does not contain any alcohol, although commands a premium price of $2.14 per bottle! 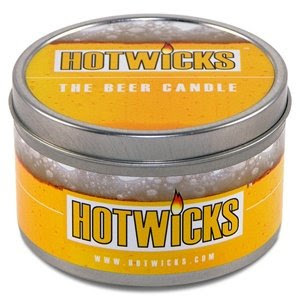 With this beer scented candle, you can waft a beery aroma around your home, without spilling a drop of your drink! If that isn’t appealing enough, the Hotwicks website offers some complementary scented candles to help you recreate the mood of some very special locations. Such candles include The Urinal Cake Candle, The Stripper Candle and the Hippie Candle. The trend for flavored beer has given us some interesting combinations, but I think pizza flavored beer is in a category all of its own. 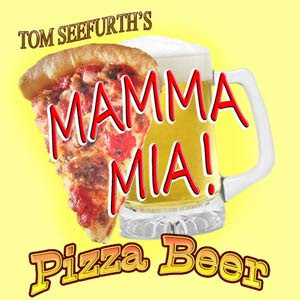 Created by Chicago brewer, Tom Seefurth, the beer is endowed with the essential flavors of a margarita pizza: tomato, oregano, basil and garlic. No prizes for guessing what food pairing they might suggest with this drink. Just when you thought things couldn’t get stranger than dog beer… We’ve all seen humorous photos of small babies holding beer bottles. Well, here’s a product idea that takes things one step further – fake beer for kids. The packaging is designed to resemble a six-pack of beer and the beverage even has a head of foam when poured. The drink itself is merely apple juice, however. could you bring home some of the pizza-flavored beer too, please? Beer and Milk?! How about just fermented milk? If it's good enough for Genghis Kahn, it's good enough for me! Never had marmite...remind me to try it. And fake beer for kids, forget about it! My kids drink the real thing! I'll keep my pizza a beer separate until it combines in my digestive system, thank you very much! By the way, no bonfires tonight due to rain, but happy Walpurgis Night to all!